Stress-Free Baby!, originally uploaded by tadnkat. Now that is a stress-free baby! Mackenzie was down with Kat on the mall, helping out at the Dianetics table set up down at the Cherry Blossom festival. She’s just about the most stress-free, problem-free baby that anyone’s ever seen, so of course Kat was getting asked if the Baby was getting Dianetics. 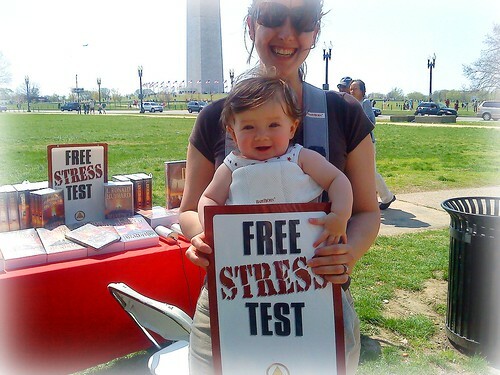 Her answer was no – the Baby hasn’t been getting Dianetics – but the parents have! 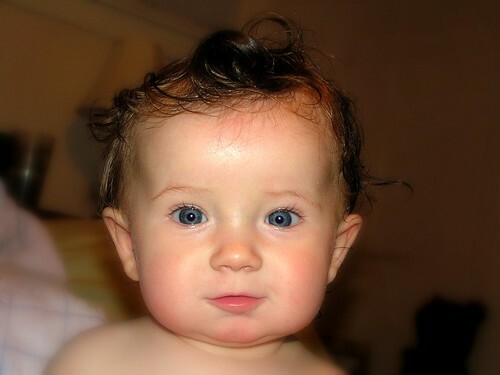 Via applying Dianetics principles to have a stress-free pregnancy, to addressing the delivery itself with Dianetics, we’ve managed to avoid any semblance of post-partum depression or other associated issues, and have also resulted in one of the most stress-free babies you’ll ever see! Now THAT is an Aware Baby! Sporting the Post-Bathtime Elvis Curl Action, originally uploaded by tadnkat. Ever since she was first born, we’ve been getting comments that Mackenzie is the most aware baby they’ve ever seen. 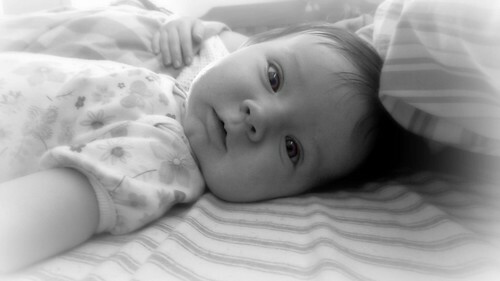 That’s an attribute she’s not shed in her first 7 months – she’s only become more aware, more alert, and just as happy. (a) No Drugs: Out of the 25 babies who were in the recovery room at the hospital when Mackenzie was born, Mackenzie was the only one that was born entirely natural, and with no drugs of any sort. We had a great midwife who had just given birth totally naturally to a set of twins, and was all for just working with my wife’s willingness to get that baby out. Even though there’s debate on how much the drugs such as an epidural, etc actually pass to the baby – the empirical evidence is that when momma had drugs, babies were less alert, less communicative, and less “there”. Now, as a Scientologist, I don’t debate that when you’ve medically got to have drugs to make the delivery go, you do whatever is necessary in the interest of the health of the mother and the baby. But in our case, it worked out great. (b) Happy Household: In Dianetics, L. Ron Hubbard describes the massive effects a happy household can have on the health of a baby – and conversely, the detrimental effects on a baby’s health and happiness when the parents fight. My wife and I use Scientology to solve all of our day-to-day problems with communication, and haven’t had the occasion to fight at all since Mackenzie was born, or during the pregnancy. I’m sure there are other factors – ones that Mackenzie herself can take the credit for – but the ones above I think are significant. Listening to the Dianetics Audiobook with the little one, originally uploaded by tadnkat. I’ve got the baby for the night tonight, as Kat is in DC on study at the Church of Scientology in DC. So, I decided to do some study tonight as well, on the Dianetics Audiobook. She’s just been sitting there, interestedly listening ever since I fired it up. Great! 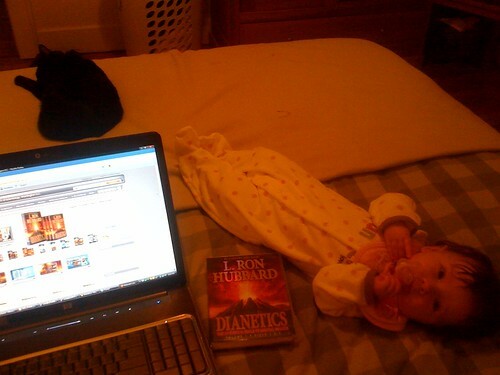 She’s going to be more conversant with Dianetics than any other 4 month old! Day 131 | Last Morning of the Decade, originally uploaded by tadnkat. On the day of this photo, Mackenzie celebrated the turn of the decade, and her very first 1 January. Many more to come, I’m sure. But one thing I wanted to bring to light with this post is that, at over 4 months old, Mackenzie has yet to be sick at all. We’ve been told over and over by various jealous parents that our first doozie was going to be “right around the corner”, but she remains totally healthy, with her absolute worst spat being a little runny nose about a month ago. Now, you could say, “we’ve been blessed”, or perhaps, “we’ve just been lucky” or any number of things which would put us as the silly, unwitting recipients of a wunderbaby. Well. we do indeed have a wunderbaby. However, being an effect and not cause is not the position anyone (much less a Scientologist) wants to be in, so my wife & I looked for what we were causatively doing as parents which precipitated this excellent state of affairs. One of the most major causes of this which we’ve been able to isolate is a sane, calm and helpful environment for the baby to grow up in. In other words, if you know anything of Dianetics, and what insanity due to engrams can do to an individual, simply having an enturbulated space around the baby could massively increase chances of the baby becoming enturbulated, and then getting sick. So, plain and clear, if you keep the domestic situation calm, in control, and with everyone using crisp, sane communication with a lot of love, you’ll sidestep the pitfall outlined above. Communication: One has to communicate a lot, and communicate effectively, in order to have a happy & calm household. A marriage is based on communication, and ours is no exception. Both my wife and I have had a significant amount of Scientology training on this matter, and as a result we generally go a few years at a time between arguments. When was our last one? I think about 2 years ago, actually – and that only lasted about 2 minutes. Knowing how to communicate is easily the most under-evaluated skill that there is. Assists: The other technique in Scientology which we use extremely often is that of Scientology assists. These are easy techniques developed by Mr. Hubbard to allow people to recover from injuries and upsets and to get them back into communication with their surroundings and their body. You can learn the key assists in a matter of minutes, and the entire booklet on how to do them is available free from the Scientology Volunteer Ministers website. The one we use most often is called the Locational Assist, and we find it invaluable in keeping Mackenzie totally in touch with her environment and not in a state of upset or confusion. Know any Good Lullabyes a Daddy can Sing?